Everybody stop what you're doing, because something glorious graced the Internet on Friday, August 7. More specifically, comedian and Trainwreck star, Amy Schumer, showcased her love for The Backstreet Boys via Instagram. Celebrities really are just like us! While cruising on a boat in Switzerland with sister, Kim Caramele, Schumer displayed some truly on fleek undulations while BSB's "As Long As You Love Me" could be heard in the background — YAS! If anything can compete with my unwavering ardor toward Schumer, it's boy bands from the late '90s and early 2000s. Seeing a marriage of my two favorite things in the form of Instagram video makes me feel like my birthday came early this year, and you best believe I will be replaying this gift on a continuous loop. Squees aside, I would feel remised if I didn't note that Schumer's choreography in said video actually shows some skills that would be worthy of any boy — or in this case, girl — band. 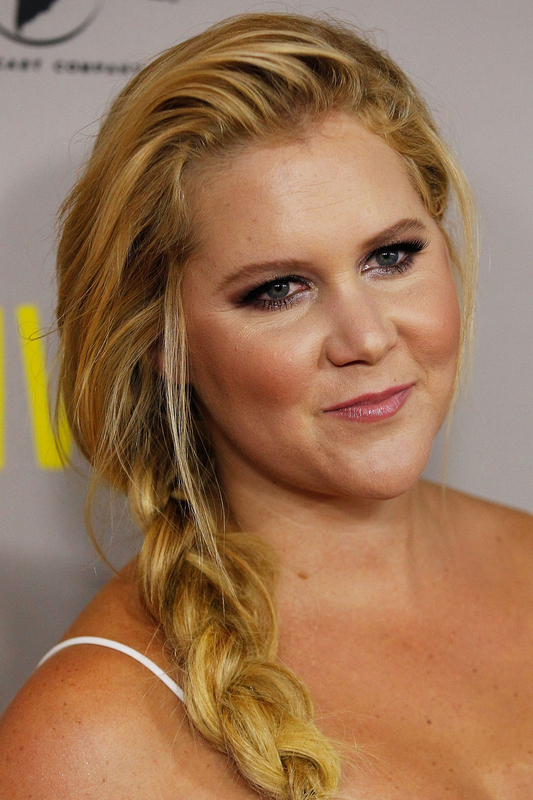 If you have seen Trainwreck, you already know that Schumer can hold her own on a dance floor, and she isn't the first celebrity to prove themselves as having more than one talent. Case in point: The Hunger Games star and Schumer's newest bestie, Jennifer Lawrence, showed off some singing acumen when she recorded "The Hanging Tree." Wait a minute! Could it be? Could Schumer's love of boy bands, newfound friendship with Lawrence, and the duo's multiple talents be foreshadowing the best thing to happen since dancing sharks flanked Katy Perry at the 2015 Super Bowl Halftime Show? What I'm trying to say here is that Schumer and Lawrence need to helm an all new girl band. It would be everything ever and don't even pretend you wouldn't buy that album immediately. Of course, there's no news or legitimate indication that this a thing that will be happening, but I would like to propose a few reasons that it absolutely should happen ASAP. We have already noted Schumer's dancing skills, but what about Lawrence? Look no further than a little Oscar-winning film known as Silver Linings Playbook, where Lawrence showed us all how it's done. I don't even think I need to explain this one. Remember when Inside Amy Schumer featured the comedian laying down some rhymes for the phenomenal "Milk Milk Lemonade" sketch? Yeah, I think I've made my point. These two know how to deliver the goods when it comes to comedy. As musical groups of yesteryear go, it isn't all about singing and dancing. When you want to wow your audience, you need to really commit to the performance. Case in point: *NSYNC in the cinematic masterpiece known as the "I Drive Myself Crazy" music video. The possibile concepts for Schumer and Lawrence's girl group videos are endless. Talk about the ultimate twofer! Maybe Aziz Ansari could somersault his way in at one point. Like me, Lawrence frequently waxes poetic about pizza. There's no doubt in my mind that pizza could play a prominent role in this hypothetical girl band — maybe Schumer and Lawrence's debut album could even be titled something like Love & Pizza. All of us fans could eat pizza while listening to it, a dancing pizza could be featured in the music videos, and...you know...PIZZA! What I'm trying to say is, I really would like a slice of pizza right now. Jennifer Lawrence and Taylor Swift have already been confirmed as buddies. With Swift's star power and ever-growing squad, she could help make this girl band the most star-studded anyone has ever seen. Did I honestly even need to offer a list of reasons in order to convince you these two in a musical girl group would be the best thing ever? Probably not, but it sure has been fun to talk about — amiright?? Let's hope that this idea comes to fruition so that all our musical dreams can finally come true. I'll just be over here anxiously awaiting the day this hypothetical girl band becomes a fixture on my iTunes.